Enthusiastically LOCAL eGift Card - Coming Soon! LOCAL offers from Unique Eugene businesses are being added every day. Give a LOCAL Gift Card to family, friends, students, co-workers, or employees! Unique Eugene, formally the Eugene Independent Business Alliance (EIBA), helps independent local businesses compete successfully, reversing the trend of losing community-based businesses to chains and mega-online companies. Independents keep Eugene an interesting and unique community in which to live. Consider the impact of your shopping decisions. 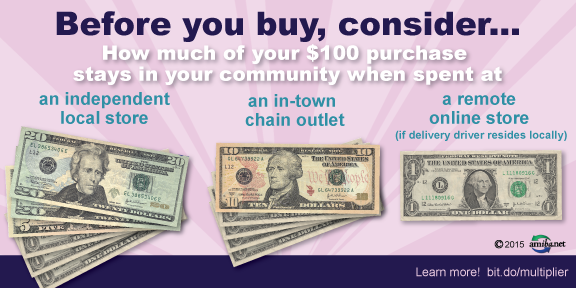 Support locally-owned Independent businesses to build economic opportunity, local character, and a healthier community. Amazon's Stranglehold: How the Company's Tightening Grip is Stifling Competition, Eroding Jobs, and Threatening Communities Like Eugene. An IBA is a cooperative effort of locally-owned independent businesses, citizens and community organizations working to ensure a healthy local economy where independent businesses prosper. Collective branding, joint purchasing, and shared advertising and marketing give members many of the advantages chains enjoy. An ongoing campaign to raise public awareness of the benefits of doing business locally to promote fully-informed decision making is a key part of the effort. People who are fully aware of the value independent businesses provide and their importance to the community more often will choose to do business locally and seek out IBA members. The IBA also provides a collective voice for independent business owners to make sure their concerns are represented in the media and government. IBAs inform local economic development and policy decisions affecting established small business community and help ensure opportunities for entrepreneurs, rather than benefiting absentee-owned businesses. The IBA is a non-profit organization managed mainly by volunteer business owners. Unique Eugene decided to form an IBA after working together as a small collective of business owners for over 17 years. We are passionate about supporting our local Eugene businesses and want to expand by banding together with the hundreds of local business owners who make Eugene such a great place to live. We want to spread the message to think local first when you shop, dine, bank, play, and hire services. You can make a difference. 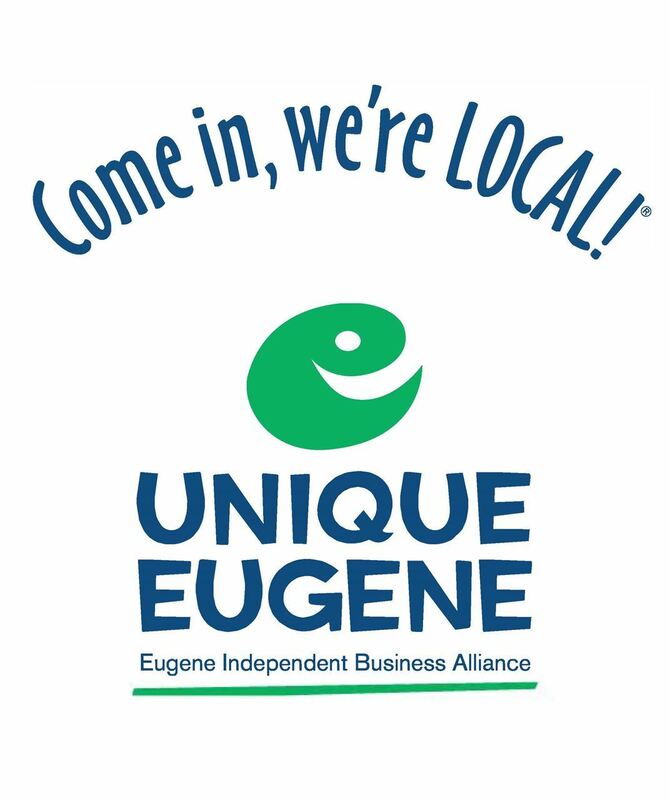 Unique Eugene was originally formed in 1999 as a cooperative of local business owners. They shared ideas, advertised cooperatively, promoted local business, and gave back to area non-profits. Many of those members are still members today and are actively working to build membership into an independent business alliance with the goal of reaching 200 members. Join us! Chicks, feed, bee hives and more....meet Bill Bezuk, owner of The Eugene Backyard Farmer. You'll find Evon Smith, owner of her family's independent bookstore, among the stacks of books at their two Eugene locations. Josh West, Riley's Furniture, is proud that his family's business has been in Eugene over 30 years and over 70% of their furniture is crafted in Oregon. Kim Still says "No Fooling" the 2017 Eugene Saturday Market season kicks off April 1st on the park blocks at 8th and Oak! As 4th generation owners, brothers Mark and Alan Ageter know everything about toys, games and hobbies! Neva Becker is General Manager of Rainbow Optics and is proud say they have been locally owned since 1977. We are seeking leadership businesses to become sustaining members of the Eugene Independent Business Alliance. Sustaining members will ensure we have a sustainable community change campaign to educate the community about the impact of local independent business. As a Sustaining member you will receive a prominent position on our website, at our events, and in our communications. Together we will engage the community to think, shop, and support local. Become a sustaining member today and we will contact you to talk about your ideas on becoming involved. Look for this decal in the window of businesses throughout the Eugene area and you will know they are enthusiastic members of Unique Eugene. Eugene Independent Business Alliance is a 501(c)6 organization doing business as Unique Eugene.